Sometimes we get so caught up in what we aren’t that we forget who we are and who lives within us. We forget that we were made for a specific purpose, and instead of wasting our time and emotions wishing we were something else, we should be using what we have already been given to glorify our Creator. I fall into this, wishing that I could be a better photographer, wishing that I could be faster in running, wishing that I had blue eyes or a curvier body, but in the midst of all those wishes, I forget all of the gifts I have already been given. We must never forget that we serve a wonderful, mighty God, and when we find our identity in Him, societal judgments no longer define who we are. This is the first week of JOY, and it will talk about the joy in confidence. What I am even happier about is that this week Grace will be writing! They want you to say no. I mean of course your answer should be no. No one could or should think that they are flawless. They'll tell you to not be that confident. Actually, that’s not even confidence. That’s cockiness. Absolutely egotistical. Don’t you dare say yes to that question. Don’t you dare think you’re flawless. But wait... What if I answered yes? 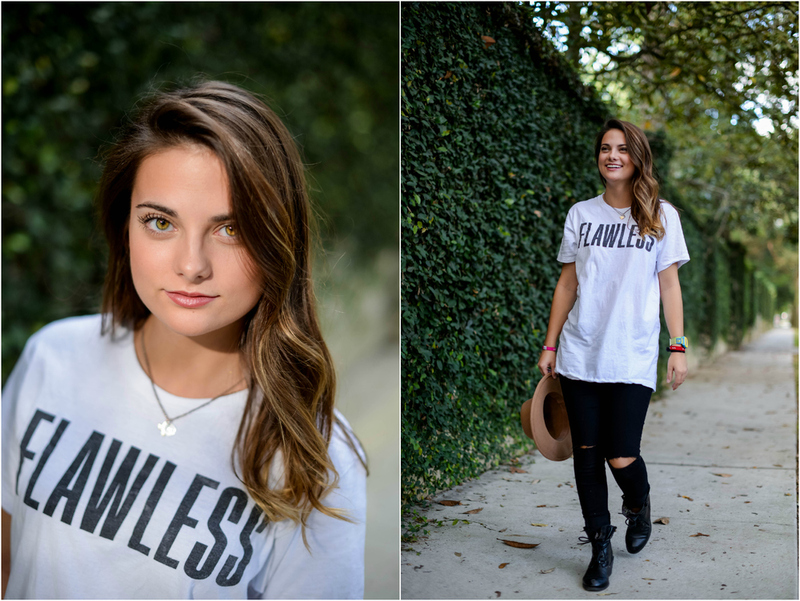 What would you say if I did, in fact, think that I am flawless. What would the world think of someone who is so convinced of this that they would feel inclined to buy a shirt that sports such an audacious claim? 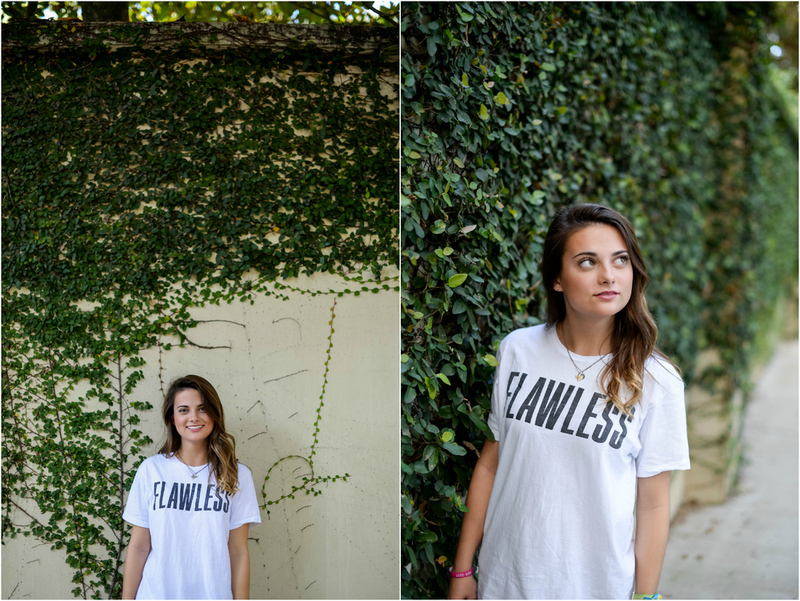 Because here’s the thing… I do think I’m flawless. But let’s not talk about what I think, rather let’s talk about why I think it. I did not start believing this because of a superb amount of Instagram likes, compliments, or even time in front of the mirror. Quite honestly, I haven’t thought this for long. I have been extremely insecure for most of my life. It wasn’t until the middle of my summer, when I rededicated my life to Jesus Christ, that I started to look at my body and soul through a different lens. So where does the flawlessness come from? It comes from a cross. THE cross. It comes from a Savior so bold and beautiful and loving that he would take the weight of every sin I would ever commit. That he would take the rightful punishment. The Bible says that the wages of sin is death, and that’s exactly what happened. A God so good looked at the world and decided that He loved it so much that He would send his most precious son to take our place in punishment just so we could live in relationship with Him. Flawlessness comes from redemption. It is a wretched, stained, and sin-filled life that is saved by the greatest of all loves. It is a blood-washed romance. It is the Gospel. If you are looking in the mirror to try and find perfection and flawlessness, I hate to break it to you, BUT you aren’t going to find it. Nothing about you and I are perfect. That’s where the cross comes in. 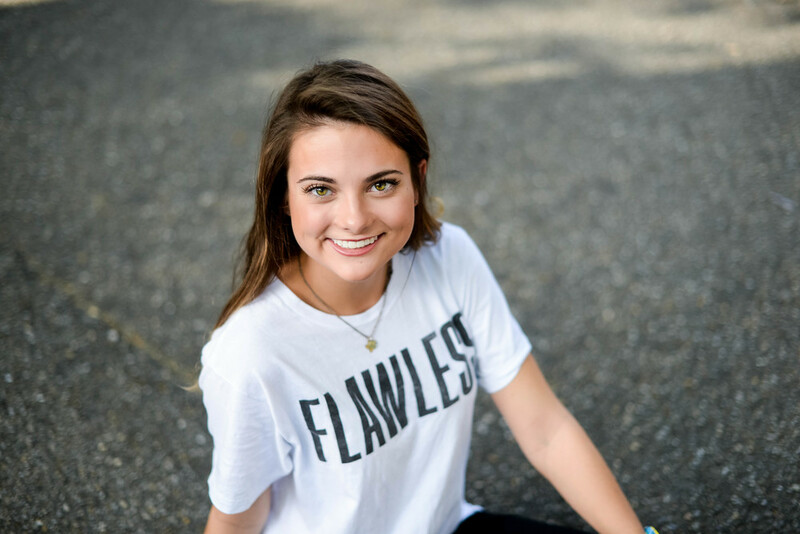 So why would I think I am flawless? Because, in the words of MercyMe, the cross has made me flawless. Every sin has been washed away. I am far from perfection, but I have been saved by Perfection himself. This realization… this redemption has a really powerful way of making you confident. I get to live my life like I believe I am loved by Love. I am given the confidence to walk around like I am precious enough that the King of all Kings would lay down his life for me. I get to dwell in the benefits of the cross. It is not me, but He who is within me. This mindset changes everything, and I mean everything. Even when life is in a valley and I want to be reckless and down on myself, I can’t be. For a king to go through that amount of torture and pain just so that I may know him personally means that He deserves nothing but my best. That means my best praise, my best attitude, my best mindset. For me personally, this means I look at myself as precious. It means that I recognize myself as rid of every flaw and every sin. 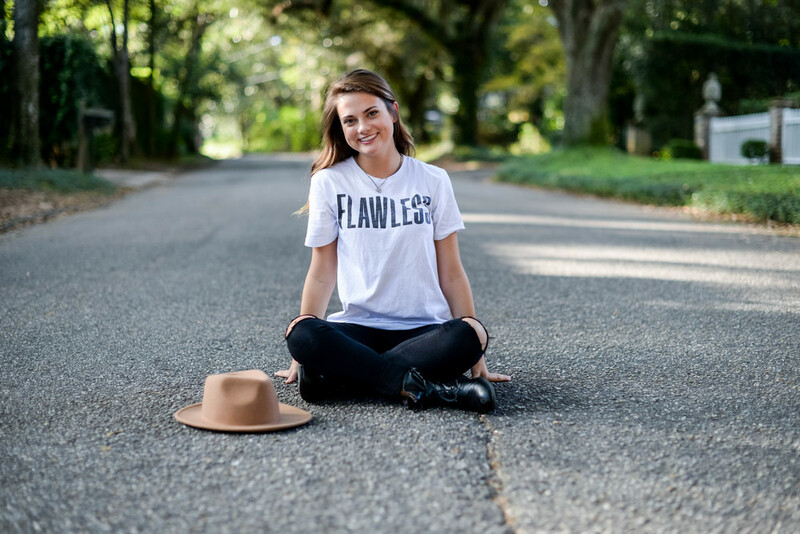 Flawlessness is not Grace, but amazing grace. This idea behind “Joyful Mondays” is recognizing the things that bring us joy in life that we primarily skip over. I think that as believers, we primarily skip right over the joy in flawlessness. We forget that redemption is so beautiful and it can and should bring joy to our lives. Happiness is temporary, but joy outlasts every trial, every mountain, and every valley. Dear believer, remind yourself that you have been made flawless. Remind yourself of the joy that should come with this realization. Step away from your sinful nature and walk right into the peace of knowing and living for Christ. One last thing. You should remember that there is NO place that God’s love can’t reach. There is no life past the point of redemption. God desires to know you, know your heart, and make you flawless. He sent his own son to take your place. You are so loved. You are precious enough that a King would die for you. He doesn't care what you look like, what your grades are, or what your talents are. He created you, and you are his child. The book of Ephesians is a good place to see written words of how much God loves you. 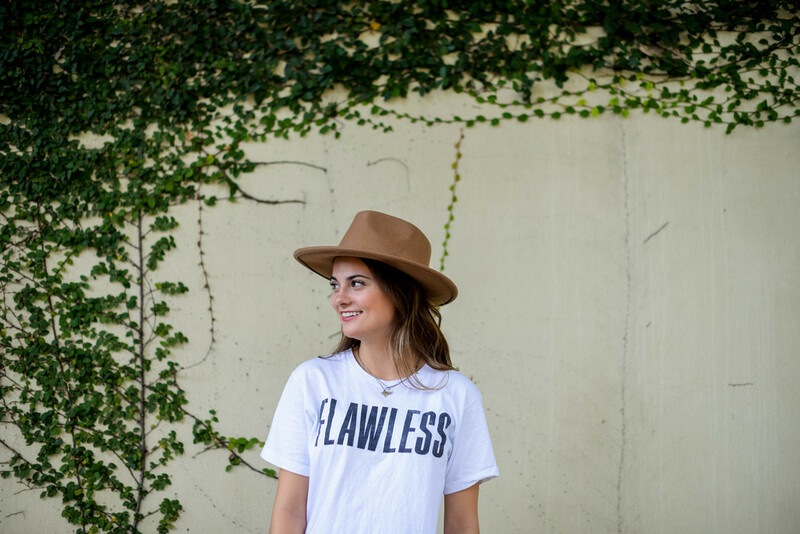 So, what if something actually made you flawless? Would you start believing it? Would you accept it? Friends, I hope you realize the extent of what has been done for you and in turn, take this new mindset and turn it into joy.